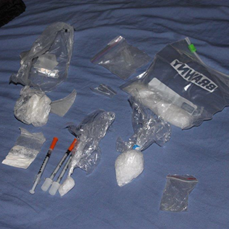 Pictured above is the alleged methamphetamine and paraphernalia taken into evidence from the home. On Monday, November 24, Deputy Bill Watkins with the Barry County Sheriff’s Office was asked to respond with a Division of Family Services Caseworker to 22157 Kestrel Ct., in Golden for alleged child abuse. Upon arrival, Deputy Watkins entered the home and met with 35 year old Tara Jo Beck. Also in the home was 41 year old Jerry Beck, 43 year old Benjamin Widhalm and 62 year old Linda Dissette. Deputy Watkins received written consent to search the home by the owner. Deputy Cole arrived to assist Deputy Watkins, and a search of the home revealed a large quantity of alleged methamphetamine with an estimated field weight of more than 50 grams. Syringes and other forms of drug paraphernalia were also located in the home. Deputy Watkins and Deputy Cole placed all four occupants of the home under arrest. At this time, Tara Jo Beck, Benjamin Widhalm, Jerry Beck and Linda Dissette have charges pending for child abuse, endangering the welfare of a child, distribution, delivery, manufacture, produce or possession with intent to distribute, deliver, manufacture or produce a controlled substance. They are in the Barry County Jail on a 24 hour hold awaiting formal charges.